TraderLynk plays an active role within the financial community, providing the market with insight, intelligence and analysis. 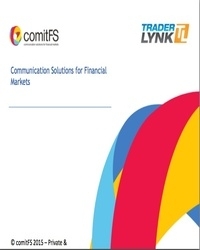 TraderLynk is a powerful and cost effective Unified Communications solution for financial markets that will provide users with a next generation collaboration experience, while offereing substantial cost savings and infrastructural benefits over legacy trading telephony and chat platforms. TraderLynk Technology is designed to allow direct communications from point to point, from anywhere to anywhere globally at the push of a button using the latest innovations with WebRTC.